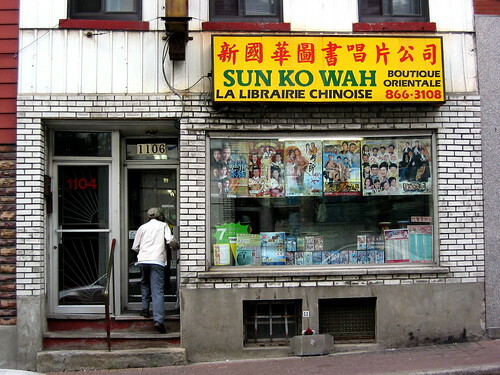 It was through a quick search to see whether the Sun Ko Wah (新國華) boutique and bookstore on this picture still existed (it probably does), that I realized that Chinatown’s now-defunct cinema on St-Laurent Boulevard (near René-Lévesque) was also called the Sun Ko Wah! Yes, according to infos on the web, this cinema existed between 1989 and 1995. My memories seem to point to a much earlier period, but the end of it may indeed be 1995, year of the exodus for many Montreal Chinese of previous immigration waves. In any case, I was still too young in 1995 to go to a movie theatre (and remember really wanting to go to it, despite my young age), and never ventured inside this manifestation of the micro and ethnic cinema in Montreal. When I got old enough to go see a movie by myself, the Sun Ko Wah Cinema became a jewelry shop. Was left behind, a different business at around the same civic number on Clark Street, bearing the exact same name. It was probably pirated video and the introduction of DVDs that forced the cinema to close in 1995. Chinese movie theatres in Toronto and Vancouver closed in the mid-nineties, too. You can still see them on Spadina Avenue and Hastings Street. By the way, as I mentioned before, there was another Chinese cinema (the Electra) near Ste. Catherine/Amherst in the 1980s and, around the same time, there was apparently an Italian cinema on St. Laurent near Cremazie. Oh man, I sure wish I’d had a chance to visit those theatres! I was lucky enough to live in New York during the last days of the Chinatown theatres there. The Rosemary and the Music Palace were the last two to hang on and I have some great memories of fantastic movies and fun and interesting times (the first time you noticed the rats scurrying around under the screen was always a jolt!). Beautiful old theatres. I can only imagine the charm and culture of the ones in Montreal. I’d love to see some pictures. (great site in the link, btw). Je me demandais si l’exode auquel il est fait allusion dans le texte avait à voir avec le référendum de la même année (1995)? Oui, patclou, je faisais référence à l’exode dû au climat politique autour du référendum. C’est un sujet qui m’intéresse beaucoup, d’ailleurs, et je ne me basais que sur ce que j’ai lu ailleurs ou des circonstances dans ma vie (des oncles/tantes ou des amis de la famille qui sont partis, des commerces qui ont fermé), ou des popstars de Hong Kong qui ont cessé de venir.